Designed to clean the air in open rooms of up to 5,000 square feet in size. The Air Oasis 5000PRO is a powerful commercial air purifier perfect for use in gyms, restaurants, salons, bars/lounges, restaurants, and more. With its built-in handle, this professional air purifier is great for improving the indoor air quality (IAQ) of hotel rooms occupied by smokers or for spot-cleaning job sites or buildings. 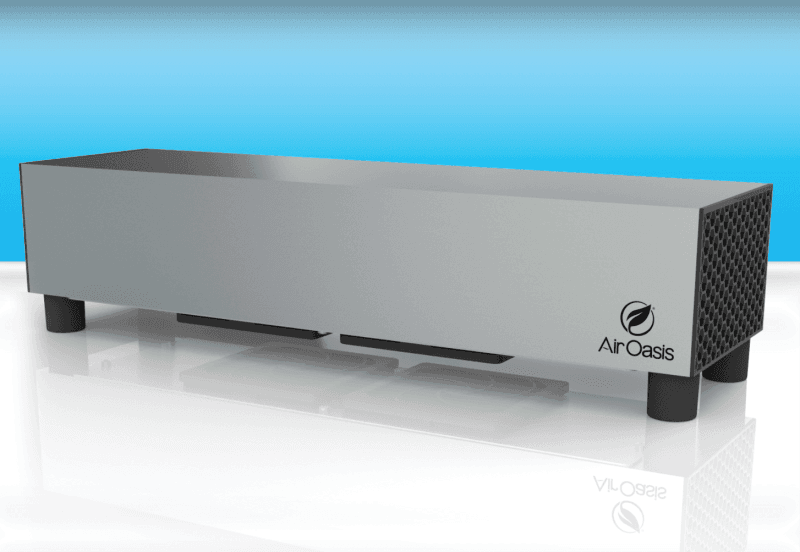 The Air Oasis 5000PRO is an easy-to-use commercial-grade air purifier with internal metal components and a durable eighth-inch-thick brushed andodized aluminum casing. It is built to last and made in the U.S.
How It Works: This commercial-grade air purifier quickly and effectively reduces carbon-based contaminants and provides the space with fresh, clean air within minutes. Carbon-based contaminants are natural impurities like bacteria, mold, viruses, foul odors, and volatile organic compounds (VOCs). These common allergens can be easily taken care of by using a commercial-grade air purifier. The Air Oasis 5000PRO is the best professional air purifier for the job because it utilizes Bi-Polar Ionization & AHPCO (advanced hydrated photocatalytic oxidation) technology that was developed by NASA and enhanced by our Air Oasis research and development team, including Dr. Jeff Bennert, Jon Bennert, and Dr. Naburum Ghosh. The Air Oasis 5000PRO is very easy to operate and turns on with the flip of a switch. Every three years, the unit requires new AHPCO cells; cleaning the washable pre-filters is the only routine maintenance needed. Our AHPCO technology removes contaminants left behind by HEPA filters and requires much less maintenance in the long run. So how exactly does it work? The UVC lamp destroys germs as it passes through UV light. The light rays react with the AHPCO catalyst to produce catalytic molecules, which find and destroy carbon-based molecules. The carbon-based contaminants are then converted into water and carbon dioxide, eliminating unpleasant odors. The Bi-Polar ionizers reduce allergy causing particulate matter such as dust, pollen and dander. The Air Oasis 5000PRO is very easy to operate and turns on with the flip of a switch. Every three years, the unit requires new AHPCO cells; there is no filter to replace or routine maintenance to perform. Our AHPCO technology removes more contaminants than HEPA filters and requires much less maintenance in the long run. So how exactly does it work? The UVC lamp destroys germs as it passes through UV light. The light rays react with the AHPCO catalyst to produce catalytic molecules, which find and destroy carbon-based molecules. The carbon-based contaminants are then converted into water and carbon dioxide, eliminating unpleasant odors and allergens in the air. 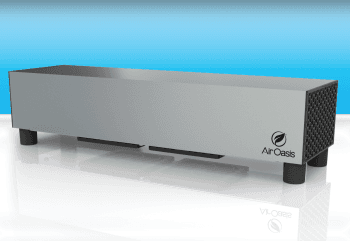 Cutting Edge Technologies: The Air Oasis 5000PRO is equipped with our latest Bi-Polar® Ionization technology, as well as our NASA developed AHPCO technology, making it the perfect purifier. Using 2 very effective technologies to rid your business of unwanted germs and bacteria. Additional Benefits: The Air Oasis 5000PRO will eliminate all odors related to pets, smoke, cleaning chemicals, mold, and much more. It also quickly reduces contaminants caused by VOCs, mold, smoke, bacteria, viruses, and many other allergens. The Air Oasis 5000PRO is a unique large air purifier because it is very energy-efficient. Uses less electricity than a 100 watt light bulb. Our unit is the best choice for commercial use because it is durable, efficient, and portable. It can be used in areas with heavy smoke smells, remediation job sites, kennels, restaurants, large gyms, and much more! Portable Air Sanifiers® are a great buy for anyone in the professional cleaning industry or for those who need to purify a large space in a short amount of time. Because the Air Oasis 5000PRO is a reliable, energy-efficient way to remove unpleasant odors and allergens from large areas, it is ideal for any commercial environment in search of a way to ensure that their IAQ is top-notch. If you have any questions or concerns, please contact us online or give us a call at 1-806-373-7788. Simple Operation: The Air Oasis 5000PRO is simple to operate. The device turns on with the flip of a single switch. There are no complicated multiple settings to learn.